U.S. Secretary of State Mike Pompeo is warning Hungary the presence of Chinese telecommunication manufacturer Huawei in the European country is complicating Budapest's partnership with Washington. "If that equipment is co-located in places where we have important American systems, it makes it more difficult for us to partner alongside them. We want to make sure we identify [to] them the opportunities and the risks associated with using that equipment," said Pompeo. 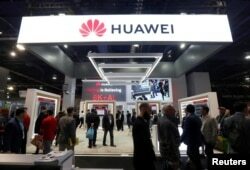 American officials are increasingly troubled by Huawei's expansion in Europe, especially in NATO member states where Washington believes the Chinese telecom manufacturer poses significant information security threats. At a joint press conference with Hungarian Foreign minister Peter Szijjarto, Pompeo said he has raised with Szijjarto "the dangers of allowing China to gain a bridgehead in Hungary." Many in China believe that the U.S. government concerns over Huawei's security are at least in part aimed at helping American companies better compete against foreign rivals. But U.S. officials reject that notion. "That sounds like a lot of mirror imaging to me," said U.S. Assistant Secretary of State for International Security and Nonproliferation Christopher Ford in an interview with VOA, noting "the Chinese government has actually been extraordinarily grand in its ambitions to do just that sort of thing with Chinese companies." FILE - Fitbit's new Alta HR device is displayed in New York, March 1, 2017. 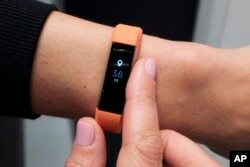 The Pentagon is doing a broad review of how military forces use exercise trackers and other wearable electronic devices. "The user in Western countries might not be aware that in China, the government has a far broader reach compared to over here, so they can request data out from a private company on national security grounds," Claudia Biancotti, visiting fellow at the Peterson Institute for International Economics (PIIE), told VOA in a recent interview. Biancotti added in China, "they don't really have independent courts to oversee the process." "If this information is sent to China, it can be easily accessed by the government and leveraged, say, to make Beijing's surveillance software better at recognizing Western faces, or at extracting intelligence on Western military activities," warned Biancotti in a recent report. The company wrote an email to VOA's Mandarin service that they regularly update their privacy policies while noting that TikTok does not operate in China. "We may also collect Global Positioning System (GPS) data and mobile device location information." But users can switch off location information functionality on their mobile device if they do not wish to share such data. "We will share your information with law enforcement agencies, public authorities or other organizations if legally required to do so," TikTok stated. VOA's Mandarin Service, Jeff Seldin and Mo Yu contributed to this report.